The park’s common effluent treatment plant meets the strictest environmental standards and is capable of treating 56 million litres of effluent discharge per day which is then piped 9kms and discharged off shore via the park’s $7.5 million dollar marine outfall pipeline. The Godavari River and a 400 million litre rainwater harvesting pond provide the park with an ample supply of water. The ultra-modern water treatment facility in the park is capable of treating 60 million litres of raw water a day. There is continuous stable supply of power to all operating units with a dedicated 200MW power substation. Power is obtained from three different sources to minimize interruptions. It offers 33KV of ready to use power right to doorstep of each operating unit. 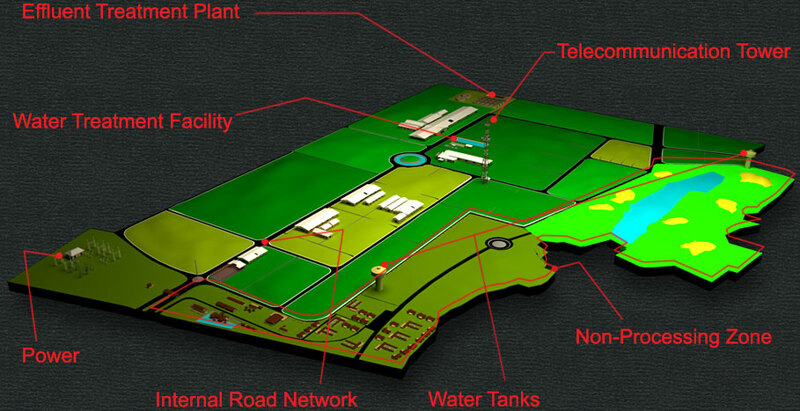 Over 250 acres of land dedicated to non-processing facilities including a 120 acre green belt, housing, hotel rooms, recreation facilities, meeting spaces and fine dining options.